Many small businesses have moments when cash flow slows to a trickle. Annual sales numbers may look great, but clients are taking 90 to 120 days to close a 60-day invoice. What are you going to do? One option is to seek funding through a lender like Kabbage or OnDeck. Kabbage and OnDeck are both finance companies that provide small businesses with credit lines. The secret sauce that Kabbage and OnDeck bring to the table is their online lending platforms which are capable of speeding up the application process and—upon approval—the distribution of funds. 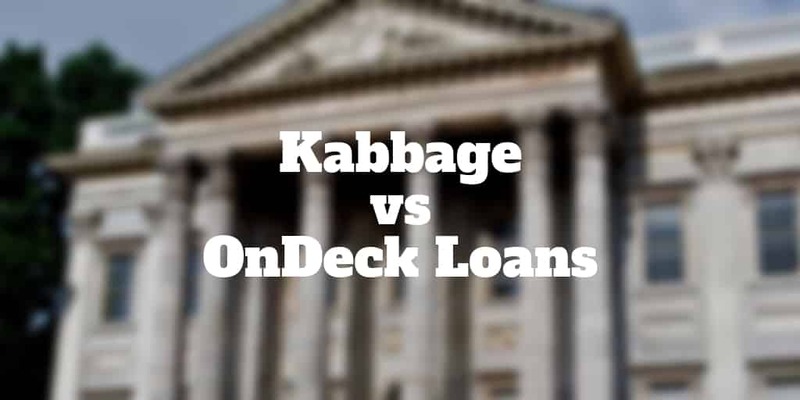 Here we compare Kabbage Vs OnDeck to see which may fare best for your small business needs. OnDeck, which is headquartered in New York City, has been around since 2006. It partners with JPMorgan Chase, which uses OnDeck’s technology to help originate and service both term loans and lines of credit. In the years since its launch, OnDeck has loaned more than $2 billion to companies representing more than 700 industries. If your small business qualifies, OnDeck can extend as much as $100,000 as a line of credit, which you will be expected to repay in weekly installments over a period of six months. Repayment amounts include OnDeck fees. If you need an amount larger than $100,000, you are free to apply for one of the company’s term loans, which range between $5,000 and $500,000. They are repayable on either a daily or weekly schedule. In contrast, Kabbage provides eligible customers with credit lines that range between $2,000 and $250,000. Kabbage offers flexible repayment options that allow customers to choose terms of either 6-, 12-, or 18- months. The 6-month repayment plan carries higher fees for the first two months. The 12-month repayment plan carries higher fees for the first six months. Each time you make a draw from the total amount of your credit line, you will negotiate new repayment terms. Kabbage and OnDeck are both known for their speedy application processes. If you meet eligibility criteria, it is literally possible to complete your online application in 10 minutes. Kabbage will give you an immediate loan decision whereas OnDeck will let you know whether you’ve qualified for a line of credit within 24 to 72 hours. OnDeck also gives you the option of completing the application process by phone. You will be charged a fee between 2.5% and 4% of the total amount you borrow to cover the costs of servicing and processing the loan even before you make any draws. That fee drops to 1.25% the second time you’re approved for a line of credit. Origination fees are not charged when you’re approved for subsequent lines of credit. OnDeck borrowers with personal credit scores of 700 or above may qualify for interest rates as low as 9%, but the interest on most lines of credit is between 13.99% and 36%. This amounts to an annual percentage rate (APR) ranging from 9% to 99%. Origination fees are factored into your interest payments. OnDeck charges a $20 monthly maintenance fee for lines of credit. This fee will be waived for the initial six-month period if you withdraw $5,000 or more within the first 7 days of opening your credit line. Kabbage does not charge origination fees. Instead, each month, borrowers pay a fee that ranges between 1% and 10% of the total amount that’s actually withdrawn as a draft. This translates to an APR between 24% and 99%. As noted above, Kabbage charges higher fees during the first few months of 6-month and 12-month loan repayments. With the former, you’ll pay between 1.5% and 10% for the first two months before the fee drops down to a more manageable 1%. With the latter, the higher fees are charged throughout the first four months of the repayment schedule. Kabbage imposes no prepayment penalties. However, they do impose late fees on delayed payments. OnDeck’s proprietary software evaluates loan candidates based on factors like cash flow, past use of credit and vendor payment history. This enables the company to render extremely quick decisions when small businesses apply for their loans. OnDeck offers both fixed-term loans and lines of credit, which means that you can get more money from OnDeck than you can from Kabbage if you happen to qualify for both lending opportunities. OnDeck has an A+ rating from the Better Business Bureau. You can borrow between $5,000 and $500,000 as a term loan from OnDeck and access up to $100,000 as a line of credit. OnDeck’s loan criteria are considerably less stringent than those of banks. In part, this is because OnDeck focuses more on the potential profitability of your business than it does on your own credit history. A negative decision will have no impact on your personal credit score. You only need to have a personal credit score of 500 in order to qualify for a term loan and a personal credit score of 600 to qualify for a line of credit. Your business must have been in operation for at least one year, and it must have generated $100,000 or more in the past 12 months. All draws on credit lines are repaid over a six-month period in weekly installments. Term loans are repaid either through daily or weekly installments over a period between 3 and 36 months. If you’re approved for a term loan or a line of credit, you will be required to offer a personal guarantee, which means that OnDeck is entitled to go after your personal assets should you happen to default on what you owe them. OnDeck also reserves the right to put a lien on your business assets in the event of a default. Once you are approved, you can receive funding in as little as 24 hours. The Kabbage underwriting process is so streamlined that many businesses are able to get loan decisions within a few short minutes of submitting their applications. In addition to relying on credit scores, Kabbage reviews business data from a wide variety of sources such as eBay, PayPal, Etsy, Square and Amazon lender accounts. If Kabbage requires certain types of written documentation from you, however, it may take as long as five business days to approve your funding. Once you’re approved, you’re given immediate access to funds, which you can receive either through your business checking account or via PayPal. Kabbage will also give you a Visa card to use with your line of credit if you like. You can make a withdrawal from your Kabbage line of credit as often as every 24 hours. Kabbage offers lines of credit in amounts ranging from $2,000 to $250,000. To qualify for a Kabbage line of credit, your business must generate $50,000 or more in annual revenue, and it must have been in operation for at least one year. You will also need to have either a business checking account or access to an online payment platform like PayPal in order to receive funds when they are disbursed from your credit line. Kabbage does not require borrowers to have any particular credit score. However, with the borrower’s consent, the company will perform a hard credit pull from Experian as part of the application review. This may have an impact on subsequent credit scores if the borrower is a sole proprietor. Kabbage will not work with businesses whose average bank balance is less than $2,500 based on the most recent three months of bank records nor will the company approve borrowers whose bank records show more than three non-sufficient fund transactions within a 90-day period. While Kabbage does not require a personal guarantee to secure a line of credit, it will file a blanket UCC lien on your business upon loan approval. This means that in the event of nonpayment, the company can go after your business assets. Kabbage offers more flexible repayment options than OnDeck does; repayment schedules can either be 6, 12 or 18 months. Monthly payments are deducted automatically from business checking accounts or from online payment platforms. The company front-loads its fees into the initial months of its 6-month and 12-month repayment schedules. During the first two months of the six-month schedule, fees between 1.5% and 10% will be assessed before dropping down to 1%. During the first four months of the 12-month schedule, fees between 1.5% and 10% will be assessed before dropping back down to 1%. If you have a PayPal account, disbursements from your line of credit can be practically instantaneous. To select your funds deposited into your business checking account, disbursement can take up to one to two days depending on your bank’s internal policies regarding the transfer of funds. ✅ Looser Qualification Criteria: Kabbage has far more lenient criteria regarding annual revenue, and it does not have minimum credit score requirements. This makes Kabbage a more attractive option than OnDeck for small businesses whose credit is not the greatest. ✅ Lower Rates: For a borrower who can qualify for an APR under 20%, OnDeck offers lower rates. For most borrowers, however, the difference in rates between Kabbage and OnDeck will be negligible. ✅ Faster Processing Timelines: In many cases, Kabbage can deliver a funding decision within minutes. OnDeck typically takes 24 to 72 hours to approve a loan request. ✅ Fewer Fees: OnDeck imposes origination fees while Kabbage front-loads its fees onto the first few months of repayment. However, OnDeck drops its origination fees after the third line of credit approval, making it a more attractive option for businesses that are looking to establish a long-term relationship with a lender. ✅ Relaxed Repayment Terms: OnDeck imposes a weekly repayment schedule, which can be hard to meet for businesses with cash flow issues. Kabbage’s repayment schedule involves monthly installments, which is probably more manageable for most businesses. ✅ Large Loan Amounts: The most OnDeck will offer you in a line of credit is $100,000. However, if you meet the criteria for a term loan in addition to a line of credit from OnDeck, you can have access to up to $600,000. ✅ Lines of Credit: Kabbage offers a larger line of credit. If you qualify, you can access up to $250,000. You’re a small business owner whose personal credit is less than stellar. You need working capital fast to cover operational expenses like payroll and inventory. You feel confident that you can pay back the amount you borrowed within six months. You have a strong credit rating and can qualify for a loan at a low APR. You need access to a sum in excess of $250,000 quickly. Atlanta-based Kabbage was founded in 2009. Kabbage’s only financial products are credit lines. Kabbage has formed a strategic partnership that includes Citigroup, Inc. to address the cybersecurity risks faced by banking and financial services that primarily use digital technology. It has provided more than $1 billion in loans to more than 100,000 small businesses over the past decade.